The collaboration with the artist Marit Benthe Norheim started in the mid 1990's and has resulted in works like the sound installation "Rolling Angels" together with the choir piece "Angel Revelations" which was shown in a series of locations in England, Scotland, Denmark and Norway in the years 2000-2001. He also composed the work "The Journey Between Laughter and Tears" for the interior of the sculpture "The Rat Maiden", which was created for the Ibsen Centenary in 2006, and music for the inauguration of several of her sculptures. Between 2006-2008 he produced music for Marit Benthe Norheim's moving sculptural installation "CAMPINGWOMEN" which was a part of the European Capital of Culture Stavanger 2008. Geir Johnson is now in the process of composing music for the project "Life-Boats" in which he will enhance the experience and content of the each of the three sailing sculptural women with his soundscapes. 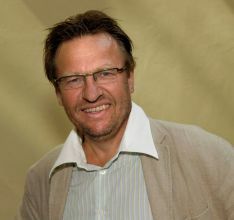 Geir Johnson (1953) was born in Fredrikstad, Norway and received his first musical training as soprano soloist in the St. Johannesguttene boys' choir in Oslo. He studied music and philosophy at the Universities of Oslo and Bergen, receiving his Ph.D. in 1983. In 1988-89 he studied computer music at Stanford University, but apart from that is largely self-taught as a composer, and has written approximately 60 works in diverse genres. Beginning in 1996, his collaboration with sculptress Marit Benthe Norheim has represented a central line of his works. In 2000 he wrote “Angels’ Revelations”! for 16 part chorus and soprano soloist, which has been presented in several countries, performed by the Norwegian Soloists´ Choir and Siri Torjesen with the composer conducting. 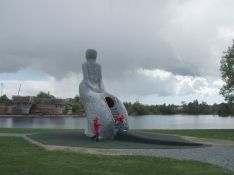 This piece is part of a large outdoor sculpture installation called ROLLING ANGELS, for which Geir Johnson also composed the electro-acoustic music. 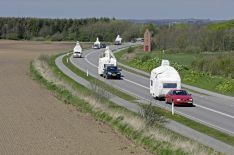 In the summer of 2008 he wrote the music for another large-scale outdoor installation called CAMPING WOMEN, by sculptress Marit Benthe Norheim. This installation has been shown all over the south of Norway, and is one of the main works to be presented at the Eureopean City of Culture program in Stavanger this year. Geir Johnson has a varied musical background, having performed both as a solo performer and as a conductor of choirs and contemporary ensembles. Furthermore, he produced and conducted a series of larger music events during the 1980`s, with works by both Norwegian and internationally recognised composers. Between 1998 and 2009 he was appointed Artistic and Managing Director of the ULTIMA Oslo Contemporary Music Festival. From 2006 he has developed the Transposition program which is based on collaboration between six Norwegian and five Vietnamese music institutions. 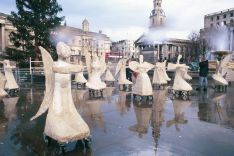 The concept behind the electro-acoustic music is that each angel has a unique soundscape which accompanies it and which is located inside the angel and follows it as a permanent installation. The sixteen angels must be able to "perform" the music together i.e all the sounds must be heard in the same acoustic space, but also be interesting enough to be left unmonitored in an urban environment. The basic idea behind the sound installation is the transformation of animal, bird and human sounds into a soundscape reminiscent of vocal music. The angel is a symbol with powerful connotations and it may be difficult - if not impossible - to connect the sound of an angel of unknown origin. Each sculpture will have its own sound universe lasting between 12-60 minutes. The concept behind the choir pieces is that the sculptures be seen as an event in a wider cultural historical context. The mythology surrounding the figure of the angel is the theme of a collection of poetry by the poet Henning Kramer-Dahl, who described this mythology in a style which has provided room for surprising and powerful metaphors, which encounter the reader's/listener's personal images. The result is a text that is at times lively, at times brutal, and with a fine sense of the cultural implications highlighted in this interpretation. The music accompanying these texts is mostly tonal, but also uses modern techniques like clustering, Sprechgesang and spectral sound processing. The choir piece will last for around 30 minutes. "THE JOURNEY BETWEEN LAUGHTER AND TEARS"
The music for this sculpture is based on the human voice combined with computer technology. Inside the sculpture a computer and a sampler is used which run an interactive program with musical material based on the use of the voices of four young singers. The voices are activated inside the sculpture every time a child passes certain areas on the slide inside. The song can also be heard through the sculpture via built-in loudspeakers. The outside sound will be discreet. The use of material is also based on an interpretation of the temperaments. The music consists of approximately 128 different musical symbols, each lasting up to 16 seconds. These symbols are designed to be triggered by various weather conditions such as seasons, light conditions, temperature and wind. Data from these meteorological conditions is loaded into a small computer which interprets the data and sends signals back to the sampler. The relationship between the 16 tracks is, in other words, based on the collection of data controlling the compositional process in real time, so that the musical experience will not be repeated in precisely the same way again. The energy requirements for the project are controlled by a solar energy plant installed in connection with the sculpture. The installation is done in collaboration with technicians at NoTAM. I had worked for a long time trying to find an approach for the story of this sculpture when I stumbled on Mahmoud Darwish's fantastic text "State of Siege - A State of Occupation". The text captivated me at once and set a stream of thoughts into motion both intellectually and emotionally and shook me in its simplicity in its description of the things that occupied people have to do daily and which refugees also have to do. I had just been to Ramallah and experienced at first hand the living conditions of Palestinians, the daily oppression and degradation and their gratitude over the fact that somebody from the West had come to be an eyewitness, and this was perhaps why the text was so powerful. In any event, I managed to thank him personally over the phone and it was not easy, but it was possible to explain my project to him. I asked whether it would be possible to create modern, electronic music with his text, i.e. not with the traditional Arabic accompaniment. He was extremely positive and gave me complete freedom to use the text. He passed away a few weeks later and Palestine went into mourning. The text inside the sculptures is read by Tora Augestad. Like many other men, I have lived with with strong women and allowed myself, in part, to be dominated by women. Dominated, because they often make wise choices, but also because they often have a dual message - they both seduce and hold back. In "The Siren" I have tried to show this duality by letting the singer Siri Torjesen sing a powerfully seductive virtuoso composition for three voices which is contrasted with more banal statements and verbal demands. The music for Maria is based on a work that I grew up with, Gregorio Allegri's Miserere - a choir piece for a choir of eight voices which, for several centuries, was only sung in the Sistine Chapel in Rome - a papal decree made transcribing or performing the music elsewhere punishable with excommunication. But Wolfgang Amadeus Mozart thought differently and wrote it down from memory, after which the ban was lifted by the Pope. This work has always been a part of my memory throughout my life and here I finally got a chance to write my own version of this work, forty years after I had sung it as a child. The Trio Mediaeval makes it possible to hear this version. What songs does the big mother sing? For me there was no doubt. They were the children's songs from my own childhood which are played on the radio in this caravan. The collection of "Norwegian Melodies" have been an inspiration for several generations of mothers and fathers when children need to be sung to sleep in Norwegian homes and here it is Siri Torjesen who sings and plays 20 of these prime classics. Is there anything that characterises wedding music? Instead of composing the ideal wedding music, I have collected music from weddings and wedding parties from different cultures; African, Indian, Jewish, Irish, American and Southern European. And from Norway, Myllarguten's bridal march chimes in. Over the past fifteen years, I have worked on a series of works for Marit Benthe Norheim's sculptures. Some have been works for unveilings or openings. Others have been an integral part of her sculptures and some have been purely sound installations - music that will follow with the sculptures. When she asked me to compose the music for Life-Boats, it was immediately clear to me that this was a matter of at least two different tasks. The one was to create music that would follow the boats on their journeys and would be installed inside the boats, whilst the other was the music that would be used when the boats docked at their ports of call. This time I chose to undertake the first task, to create music that is inside the boats and which the public will encounter when entering the boats, or which could accompany the crew on their journey. For this music I will be exploring the mythical relationship, like the song of the sirens and Odysseus - what was it that he heard that was so beautiful that he needed to tie himself to the mast? But the music of the relationship of humankind and the sea is based on many other things. One can also ask what soundscape has followed sailors throughout the ages when they have crossed the world's oceans returning from trading expeditions or from plundering, with spices and beautiful fabrics, or with slaves and spoils of war. And included in this is the music of seafaring people, which often expresses longing for another kind of life and the songs of those who sit at home and wait, sometimes in vain, for someone who never returns. This is the starting point for the music that will fill the three lifeboats of Marit Benthe Norheim, which will not be recognisable, but will be rediscovered during the creative process.